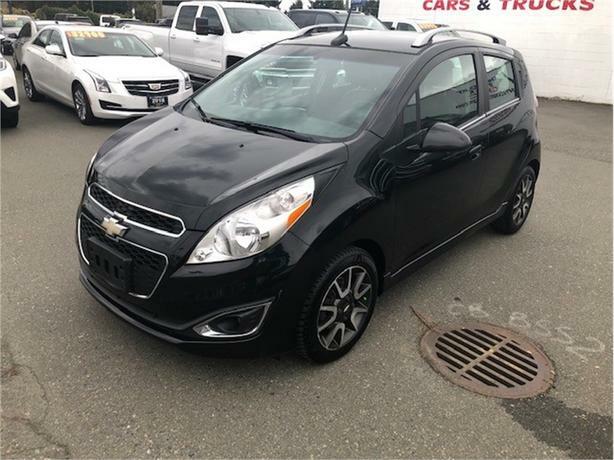 2013 Chevrolet Spark in Black Granite with Dark Cloth Interior. This Spark has ONLT!!! 76,273 Km's on it. The vehicle has gone through a 151 point Harris Certified Inspection. We replaced the front brake pads and rotors, put new windshield wipers on the vehicle. include 1.25 Litre 4 cylinder engine with AUTOMATIC TRANSMISSION. include POWER WINDOWS, HEATED FRONT SEATS, XM RADIO, STEERING WHEEL AUDIO CONTROLS, CHEVROLET MYLINK, USB PORT, CRUISE CONTROL, BLUETOOTH and AIR CONDITIONING. There is still full powertrain warranty with General Motors good till May 29, 2019 and/or 160,000 km. INTERNET MARKET VALUE PRICING at Harris Oceanside Chevrolet Buick GMC in Parksville. Our Internet market value pricing is achieved by polling third party web sites on a daily basis. This insures ALL of our customers receive a REAL TIME market value price. We feel a vehicle's value is determined by its demand and availability, not by what we paid for it. or how long we have owned it. Therefore, we DO NOT inflate our pre-owned prices in hopes of winning a negotiation contest. In addition, every pre-owned vehicle comes with a free Carproof Report. Check out our pre-owned inventory or contact us with any question. Chevy Spark for sale at a dealership near Parksville Qualicum Beach.